Make use of our feng shui living room guidelines to create a harmonious living space. Check how certain subtle changes in the living room can help restore a sense of balance and equilibrium. On successful completion, you will literally feel the positive energy 'chi' flowing through the living room resulting in an improvement in quality of life. Though primarily the living room is where the family spends some time together relaxing, celebrating, dining or entertaining, sometimes it serves other purposes too - a makeover sleeping area for guests, a conference vestibule to discuss business dealings, a place for formal affairs etc. It is a place where harmony is essential, for fostering healthy relationships or career advancement. 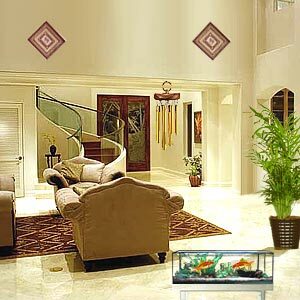 Hence, decorating your living room incorporating feng shui benefits your entire home. 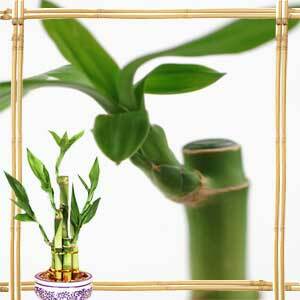 Ideally, feng shui in the living room should promote a healthy flow of chi. It is achievable when you take into account and deal with anything that contributes to cutting chi and include features that improves chi. Ensure that there is free flowing space for the chi energy to flow through. Avoid over-crowding and clutter. How do you do this? Take a good look around the living room. Consider the chairs, couches, sofas, tables, wall paintings, plants, flowers, the cushions, and decorative items in the living room. Evaluate where and how they are placed. Ideally a living room should be rectangular or square. Avoid irregularly shaped rooms so as to allow the positive energy to remain within. Avoid exposed beams on the ceiling as it can bring about feelings of stress and nervousness. The front door: Feng shui believes that all opportunities enter through the main door. The entrance should be well lit and display a feeling of happiness or all that is good. Dark gloomy entrance can discourage Chi. Make space: In case the living room wears a cluttered look, work to create more space. Use your discretion and eliminate unwanted items. Less the clutter, more freely can the chi flow all around the living room. Let the entrance be well lit to welcome chi. Feng shui recommends main door to be made of strong wood. It should open inwards. Ensure that the flooring is even. If there is a foyer leading to the living room, be sure that it has a clear path; unhindered by clutter and too much furniture. Use fresh flowers or potted plants to draw positive energy to the foyer area. Never leave wilted flowers here. Correct seating Arrangement: Chairs, sofas, couches - keep them facing the door. The ideas is simple, anyone sitting in a feng shui living room should be able to view the door. In other words a person seated on a chair or sofa should face the door. Don't place your sofa with the door at the back as it can affect your interpersonal relationships. In case, the furniture is pushed up against the walls, try and rearrange in a manner, preferably in octagonal or circular shape that fosters a relaxed and comfortable feeling. If the seating arrangement or a sofa is in front of a window or directly opposite the door, move it. It hampers flow of energy. There is energy constantly flowing between the door and window. Go in for coffee tables or end tables that don't have sharp edges. Light up corners: Pay special attention to corners, empty places and darker areas of the living room. These can dampen the flow of chi. Bring in light and brightness to these areas. It ushers in good luck, harmony and peace of mind. Consider lighting up the corners with lamps, add potted plants with round leaves only or even fix a mirror. The ideas is to attract chi and allow for free flow which otherwise would shun these areas. Remove dried plants. It can be a source of negative energy, replace with fresh ones. Cheer up the walls: According to Feng shui, hanging a happy family photograph or a picture of a large attractive tree on the east wall favors family togetherness. A picture of a waterfall or a lake on the north wall is said to be advantageous for career enhancement. Place for fireplace: If the current design of the living room doesn't provide for a fireplace, make provision now and let it be the central focus of the room. Feng shui firmly advocates provision of fireplace in living room for it stimulates and enhances happy living and provides for good flow of chi. Balance Yin and Yang: If there are tall things, add low things. In case the carpet is bright colored offset with mild colored cushions or pillows. Also strike a balance between horizontal and vertical items, hard and soft elements in order to balance yin and yang elements in the living room. A feeling of goodness will prevail. Use mirrors: Mirrors are an important element in feng shui living room decoration. For best results, the mirror should be placed strategically. Mirrors can be used to spread light to darker areas, to make rooms appear wider and spacious and also to reflect the door so that it can be viewed from a specific spot. Take care to ensure that mirrors do not reflect toilet, staircase and kitchen areas. Also, do not place a mirror opposite the door of the living room. This may reflect back the chi. Display feng shui items: Fuk Luk Sau are three star deities believed to stand for the three important aspirations of the humans - happiness, wealth and longevity. In the living room, place fuk luk sau on a high side table. Place the table in front of a wall at a height of eye view. This creates auspicious chi for the entire household. The corner that is opposite and diagonal to the main door is the lucky corner of the living room. You can enhance the vibes in this space by placing a tall lamp, fresh flowers, lush plant or a bowl of semi-precious stones or crystals. Set a fish tank: The constant movement of fish in fish tank is believed to be a good chi. So,placing a fish tank in the north of the living room is favorable. The size is immaterial for they all do the same job. But, placing a large aquarium in the living room with a large fireplace is considered to be two strong elements competing with each other. In that case, it is best to place a small fish tank or a small fish bowl with a couple of gold fish. Select right chimes: Chimes in Feng shui promote health and harmony within family, perk up prosperity and attract good friends. Take into account the size of the living room and select a suitable size. The sound ought to be clean, clear and pleasant. Prefer wind chimes in metal with 5 hollow metal that represents the five elements of nature, the fire, earth, metal, water and wood. Wood and pottery chimes may also be used with specific reference to areas in the living room. Superimpose Ba gua: In feng shui, ba gua is a map. The ba-gua map has a direction denoting 8 important aspects of life namely, family, career, education, fame, relationships, health, children and travel. To conform to ba gua, take out the floor plan of household. Remember to incorporate room names on the home floor plan. Superimpose ba-gua or sketch the ba gua over it. You will be able to understand which aspect lies in which room of your home. Apply ba-gua inside the living room and decorate appropriately for desired results. First Published Date: 2 Feb 2009 Last modified Date: April 23 2019 This page may have been updated recently as new information is available or the content may have been edited for better readability.